Trim the turkey breast. Its natural shape does not suit the rolled and wrapped Wellington. The thicker neck end can first be trimmed to establish a more cylindrical shape. Trimmings from 2kg/4lb 8oz breasts and upwards, will be enough for the 350g/12oz needed for stuffing. Once trimmed, tie the breast with a 2cm/1in gap between each loop of string, to give a rounded shape. Heat 2-3 tablespoons of cooking oil in a large frying pan or roasting tray. Season the turkey before pan frying until golden brown all over. Remove from the pan and cool. The breast can now be refrigerated to firm up before removing the string. Make the stuffing: cook the onions in a knob of butter for a few minutes until softened. Remove from the heat and leave to cool. Roughly chop the turkey trimmings before blitzing in a food processor until smooth. Add sausages and continue to blitz for 30-40 seconds until mixed in. Season and add the eggs. These can be blitzed into the meat for a further minute until the texture thickens. Spoon the stuffing into a large bowl. Mix in the onions and remaining stuffing ingredients along with extra seasoning, if desired. The stuffing can now be chilled while the bacon and pastry are prepared. The streaky bacon needs to be rolled thinner. This extends the length of the rashers helping them to wrap around the turkey and stuffing. The easiest method to follow is to lay 3-5 rashers between two sheets of cling film and press with a rolling pin as if rolling pastry. The rashers will easily thin and extend this way. Peel away the top layer of film and remove the rashers and put on a tray. Repeat until all rashers are pressed. Chill until needed. Roll the puff pastry on a lightly floured surface to a rectangle approximately 45 x 35cm/18 x 14in. The rashers of bacon can be laid on top of the pastry, leaving a 3-4cm/1½in border all round. Slightly overlap the rashers as they are laid on the pastry (you’ll need about 14-15 rashers). Spread the cranberry stuffing over the bacon, first mixing it well if it is chilled and set. Keep back a few heaped tablespoons. Remove the string from the turkey and lay the breast lengthwise and presentation side down on top of the stuffing. The reserved stuffing can now be spread along the centre top of the turkey. Lift 4-5 rashers at a time and press them against the breast. Continue until all the rashers on both sides have been lifted and pressed. The remaining rashers can now be laid lengthwise along the top, covering the stuffing that was spread there. Bring one long side of the pastry up and over the turkey. Brush the other long side with beaten egg, along the 3-4cm/1½in border, then seal. Brush both ends with beaten egg and fold up to seal in all the ingredients. 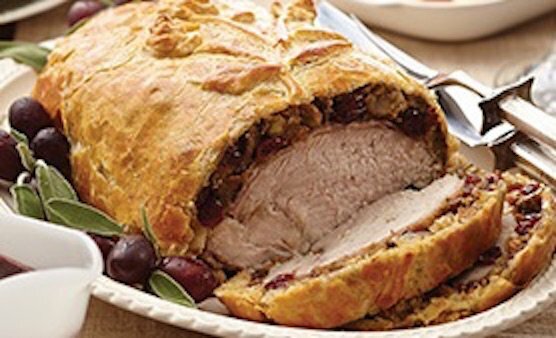 Turn the Wellington so that the presentation side is up and put on a lightly oiled baking tray, or one covered with greased parchment. Chill. To cook the Wellington: preheat the oven to 200C/Gas 6/170C in a fan assisted convection oven and bake for 1 hour 15 minutes to 1 hour 25 minutes maximum. After 45 minutes, brush the Wellington with egg to help colour the pastry. For the most golden of finishes, brush again before the last 15-20 minutes. Once cooked, remove from the oven and rest for 15-20 minutes before lifting carefully on to a carving board with two large fish slices. While the Wellington is baking the sauce can be made: melt a knob of butter in a pan, once bubbling add the shallots or onions and cook on a medium high heat until a rich deep golden colour. Add the honey and continue to cook for a few minutes until bubbling and almost caramelising. At this point add the red wine vinegar and red wine. Bring to the boil and reduce by half. Add the water or stock and return to simmer. Mix the flour with 25g/1oz butter. Whisk into the sauce a little at a time until completely whisked in. Return the sauce to the boil before reducing to a simmer and cooking for a few minutes. Strain through a sieve and season. Slice the Wellington and serve with Noisette potatoes and buttered Brussels sprouts.